Before the fourth generation of Intel processors fade into the sunset, it's going to have one last hurrah: the new Intel Core i7-5960X, 5930K and 5820K Haswell-E CPUs. Unveiled today during Intel's keynote at PAX Prime, the Santa Clara-based company's latest line of processors take heavy-weight gaming to the next level by adding an additional two or four cores to the already beefy line of quad-core Haswell i7 CPUs. According to Intel, machines packing the 5960X will allow up to 20 percent faster 4K video editing and boost in-game physics calculations by a respectable 14 percent over the current reigning champ, the i7-4960X, using Adobe Premier Pro CC and 3DMark Fire Strike to test video editing and gaming, respectively. Also on the docket for an upgrade is the system's memory processing capability. Expect the line of Haswell-E processors to work seamlessly with the DDR4 2133MHz RAM slowly trickling out of memory vendors Corsair, Kingston and Crucial. Admittedly, eight cores may be overkill. With only a handful of applications properly threaded to handle that much processing power it's improbable you'd see a cost-effective increase in the day-to-day use of your PC - though, that's up for debate until we test out a unit for ourselves. However, the 5960X theoretically supports four SLI-enabled GPUs and that latest round of RAM, giving gamers good reason to pay attention to the power-hungry Haswell-E chip. Plus, considering the CPU can be overclocked to a hasty 3.5GHz, it's sure to turn some heads. That premium speed boost comes at a price. 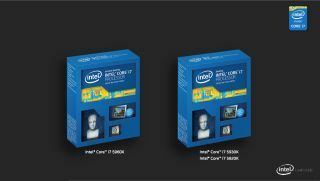 Stateside, the Intel Core i7 5960X will retail for just under a grand ($999, about £600, AU$1,070) while the 5930K and 5820K will get $583 (about £350, AU$624) and $389 (about £235, AU$416) price tags, respectively. Thinking about upgrading your rig? Haswell-E chips only slot into into LGA 2011-v3 sockets, which, at this point, haven't hit the market. Manufacturers are sure to start rolling them out soon, though, so expect octo-core processors take over the mainstream this time next year. Want to get a sneak peek on Intel's upcoming hardware? Check out our Haswell vs. Broadwell primer!